We were in the car recently talking about the following, and we want to share our conversation with you. We’ve all heard this common verse repeated by hopeful lovers while removing each petal from a daisy. When the last petal is taken your fate with this person is supposedly revealed. But is it really? Can’t we, as married couples play this game in regards to how we judge our spouse’s actions towards us, questioning their love for us based on our disappointment? Your husband forgets to call home when he’s running late from work. The wife fails to complete the one task her husband specifically asked her to do that morning. The husband fails to keep his commitment to pray together before they go to bed. The wife falls asleep while her husband is telling her about his difficult day. How we react to similar situations reveals the maturity level of our relationship. Thinking the best is really the best for our marriage. 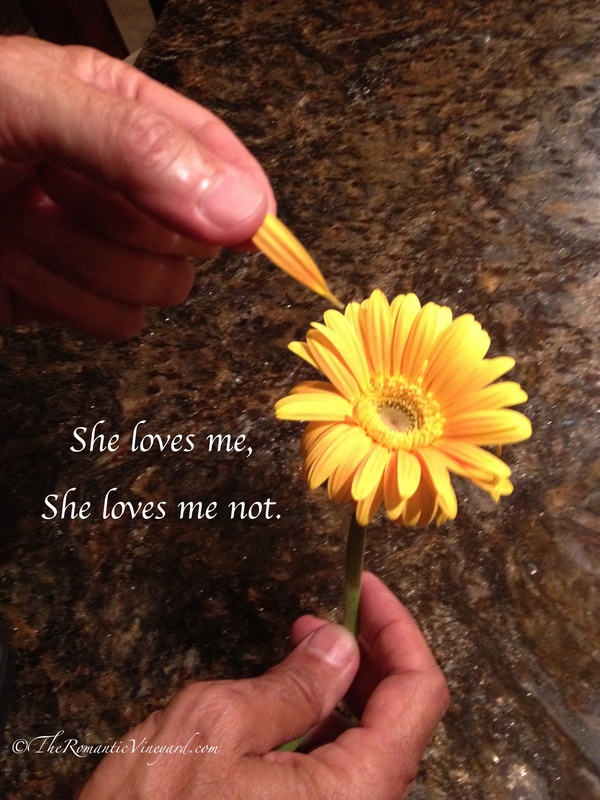 Instead of saying, He loves me…he loves me not. Next time repeat this to yourself: he loves me, he loves me, I know he loves me. And see if it doesn’t help prevent the inevitable pity party we can often throw ourselves. And it might help take your marriage to the next level of maturity as well. This entry was posted in Christian Marriage, communication, Conflict and tagged Christ, Christian, Education and Enrichment, God, He loves me, he loves me not, Husband, Love, marriage, relationship, She loves me, she loves me not. Bookmark the permalink. So true! The problem is, we filter each other’s actions through OUR mindset and “rules.” I would fall asleep while someone was talking to me only if I didn’t care a whit for them, so that must be how they feel. But each of us has our own set of rules. Exactly – “we filter each other’s actions through OUR mindset and “rules.”” This is what can be so wrong. We may think to fall asleep is proof that they don’t care based on the fact that we would never do such a thing. But, that doesn’t mean this is how our spouse feels. They may genuinely care, but be too tired to stay awake. Attaching motive to their actions based on our mindset is dangerous for a healthy marriage.